U.S. coin production slowed in February but held above one billion coins for a second month in a row and was quicker than a year ago, according to the latest manufacturing figures from the United States Mint. 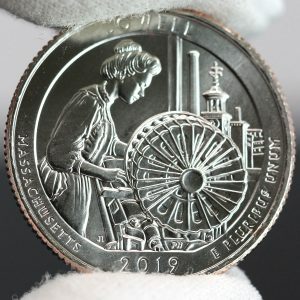 Mint figures also revealed mintages for Massachusetts’ Lowell quarter, the first of this year’s five quarters with unique designs. More than 1.25 billion coins spread across cents, nickels, dimes, and quarters were struck for circulation last month, driving the year-to-date total to over 2.7 billion coins. The Federal Reserve always orders more 1-cent coins than any other denomination even with the latest available data showing it costs the U.S. Mint 1.82 cents to make and distribute each one. The bureau produced 707.6 million Lincoln cents in February, representing 58% of the circulating-quality coins produced for the month. 9.7% for America the Beautiful quarter dollars. Native American $1 Coins and Kennedy half-dollars are no longer ordered by Federal Reserve Banks but they are still made in circulating finish for coin collectors. In January, the U.S. Mint tends to strike both coins to the expected amounts needed for the entire year. But after saying that, the bureau’s data for February did show an increase of 140,000 in 2019-D Native American dollars. Reported mintages for the space-themed piece are now at 1.54 million for Denver and 1.4 million for Philadelphia for a combined 2.94 million coins — up from last year’s dollar mintages by the just added 140,000. Mintages for the 2019 Kennedy half-dollar remained the same, totaling 3.4 million coins with equal splits between the Denver and Philadelphia Mints. Last year’s half-dollar was the most produced since the one from 2001. It saw 6.1 million from Denver and 4.8 million from Philadelphia for a combined 10.9 million coins. U.S. Mint facilities in Denver and Philadelphia manufacture all of America’s coins for commerce. Last month, the Philadelphia Mint struck 671.46 million coins and the Denver Mint made 584.64 million coins. In the January to February period, the Denver Mint struck 1,305,220,000 coins and the Philadelphia Mint made 1,458,180,000 coins. Their combined year-to-date total rose by 2,763,400,000 coins, which is 3.6% more than the 2,668,050,000 coins minted during the first two months of last year. If the current production pace stretched through to December, the annual mintage for 2019 would near 16.6 billion coins. The Mint made over 13.1 billion coins for circulation in 2018. So far, the U.S. Mint has released two annually issued coins with one-year-only designs. They include the 2019 Lowell National Historical quarter for Massachusetts, released on Feb. 4, and the 2019 Native American $1 Coin, released on Feb. 13. As mentioned earlier, Lowell quarter mintages were reported for the first time. They registered at 87.8 million from Denver and 83.6 million from Philadelphia for a combined 171.4 million. If unchanged, this would mark the lowest mintage total for a quarter in the series since issues from 2012. There are 191.6 million in quarters that the U.S. Mint has yet to officially assign to a design. These are likely a portion of Northern Mariana Islands’ American Memorial Park quarters scheduled to launch into circulation on April 1. It literally does not make sense to make cents. Can we stop making them other than for the various coin sets? Pennies make the world go around. If you shop at Publix in Florida you better not be short a penny,you will not get your groceries!!!? ?